I had ambitious plans for today — too ambitious, as it turns out. In retrospect, I tried to do too much, and in the end, Kris and I both paid for it! The little patisserie near our hotel. We ate here often! Like Italy, France is packed with single-purpose shops. 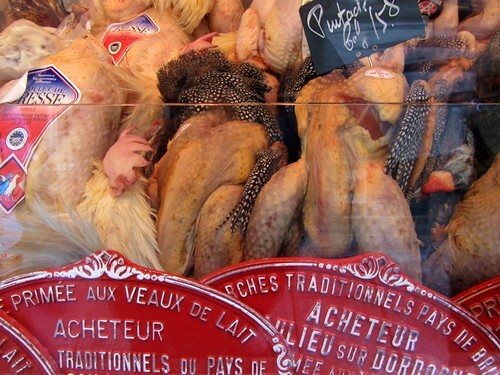 One shop specialized in poultry. Then we hopped on the metro and zipped down to the world-famous Notre Dame cathedral. We were fortunate to arrive early; the place was uncrowded, but by the time we’d left, it was packed! Notre Dame is a gothic cathedral built on the Île de la Cité, the ancient birthplace of the city of Paris. Construction on the church began in 1160 and took nearly 200 years to complete. In 1831, Victor Hugo published his novel The Hunchback of Notre Dame, and the church has remained prominent in popular culture ever since. Though Kris found Notre Dame unimpressive compared to the cathedrals we’d seen in Italy, I liked it. It’s simple but beautiful. I liked the rose windows, the vaulted ceiling, and the ambulatory. I also liked the choral music that was being piped over hidden speakers; it added an air that had been missing in other churches. 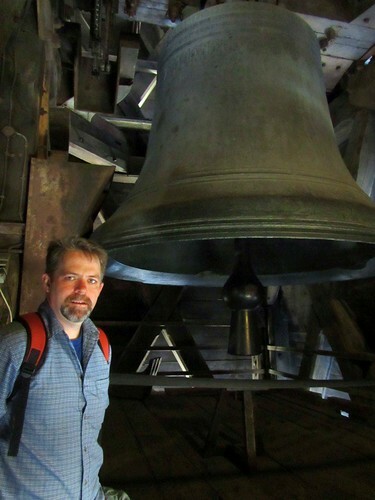 Most of all, I enjoyed the climb to the bell tower! Kris was more impressed with nearby Sainte-Chapelle, a gothic chapel built sometime before 1248. She especially liked the intricate tile flooring and the many stained-glass windows (most of which are original!). A highlight for me, however, was finding a store that specialized in French comic books (known as bande dessinée). These comics are sold in hardbound “albums”, the best known of which are Tintin and Asterix. But there are hundreds (or thousands) of other series that have never been imported to the U.S., and this shop had tons of them. I picked up a handful of English-language translations. In the afternoon, we used the second day of our two-day hop-on/hop-off bus pass. We boarded a bus for Montmartre, but it was a disaster. As with the previous day, traffic was terrible. Worse, the tour was completely uninteresting. This bus tour was definitely a low-light of this trip to Europe. After an hour of suffering, we bailed and took the metro back to the hotel. In the evening, I got bold. I suggested we walk from the Hotel Muguet to the Louvre Museum. Which we did. That was about three kilometers. Then I urged Kris to walk up Paris’ grand boulevard, the Champs-Élysées. Which we did. (The Tuileries Garden had just closed, so we had to go around.) We made it another three kilometers before we stopped for dinner. For dinner, we had lousy steaks. We had expected French food to be equal to (or better than) Italian food, but that didn’t hold true for us. Sometimes it was good, but generally it couldn’t hold a candle to the meals we ate in Venice, Florence, and Rome. After dinner, we tromped another 1.5 kilometers to reach the Arc de Triomphe. We climbed to the top of the arch and waited for the Eiffel Tower’s hourly light show to commence at 22:00. The view of Paris was beautiful. I recommend this to anyone who visits the city. The reward for all of our walking was a spectacular view of Paris at night. I’d hoped we could finish the evening by walking the rest of the way to the Eiffel Tower (2.5 kilometers) and then back to the hotel (1.5 kilometers), but Kris had a melt-down — her worst of the trip. (My worst melt-downs all came in Italy, you’ll remember.) She was cold and tired and ready to return to the hotel. 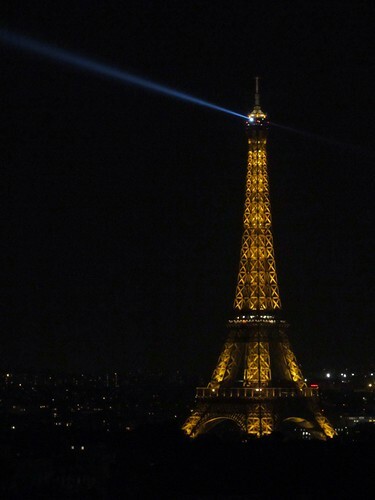 So, when my super-power (direction sense) failed, causing me to lead us away from the Eiffel Tower, she’d had enough. We found a metro station and headed home. In fairness to Kris, my pedometer told the story at the end of the day: We’d walked more than fourteen miles (22.5 kilometers), most of it at the end of the day. Just last week, I walked from home into downtown Portland. That walk (combined with my other walking throughout the day) gave me almost exactly the same step count as we had that day in Paris — and I was exhausted. So, once again, Kris Gates was right. I pushed us too hard! 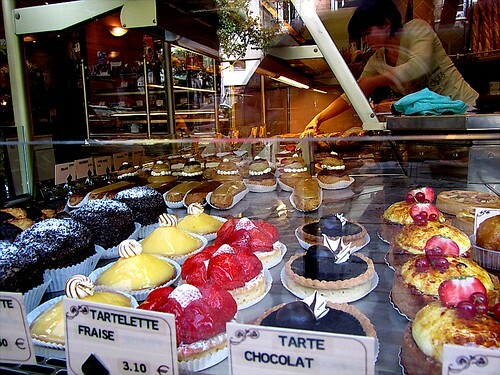 Those tarts look delicious! Michael Jackson in the background while eating Parisian hot dogs…priceless.